Swallow tattoos are rich with history and symbolism; the little bird has been linked to health, wealth, loyalty, and the rigors of long-distance travel. This has made the Swallow tattoo a popular image for sailors. The majority of swallow tattoos are designed in the image of the barn swallow which is native to Europe. Traditionally blue in colour, with a long, forked tail, representing the freedom of the blue skies and eternal happiness. Swallows, except when migrating, will never fly too far from home. So when sighted by the sailor the swallow represented a symbol of hope; as it meant they were close to land and home. Migrating swallows are known to always return home to San Juan Capistrano each year. The traditional old-school Swallow is said to be a symbol for enduring love and loyalty; so it is believed that sailors with a swallow tattoo would always return to their homes and families as well. Swallows being monogamous creatures choose only one partner to mate with for life. In terms of jail house tattoos, swallows on the upper part of a hand between the thumb and index finger can also symbolise that the person has been in prison, having ‘done bird’. The swallows, have also been used to represent white authority. In Scotland it usually signifies a spell in the infamous Bar-L or Barlinnie prison in Glasgow. The swallow tattoo in England means “these fists fly” when referring to fights and ‘hard men’. It is also considered an “American Traditional” or “Sailor Jerry Adams” style of tattoo. So why is the number 13 lucky for tattooists? Tattoos being offered in celebration of Friday the 13th has long been an event that collectors have looked forward to, and the tradition being that tattooists will charge £13 for certain tattoos on Friday 13th. The tattoo of the number 13 is considered a “lucky” symbol, and is often accompanied by other “lucky” symbols this goes back to the days of traditional tattooing but today is still one of the most popular numbers to have tattooed. So, why do tattoo supporters embrace what others fear? There is a large group of people who consider the number 13 to be unlucky and for some they feel that the day even holds dangers; with Friday the 13th being considered as being the unluckiest day of the year. Most high-rise buildings will not have a 13th floor, and there could be fateful results if you have 13 guests sat around a dinner table. The Roman numerals Xlll on during a tarot card reading is supposed to denote death. There are some cultures, however, that see the number 13 it as a symbol of life, fertility, and prosperity. Judaism celebrates a young man’s coming of age when he turns thirteen. In Punjabi, the word 13 is pronounced tera, which also means “yours,” which is a devotional pronouncement to God. In Hinduism it is the 13th day following a death is the day on which a memorial feast is held for the departed. There are, as always, many different theories as to why people became so superstitious about the number 13. The Nordic legend is in regard to the Norse god of mischief, Loki, who was said to be the 13th, and uninvited, guest at a party where he caused the death of Balder the Good. In biblical history, 12 disciples joined Jesus for the Last Supper. Judas, the last and 13th member betrayed Jesus leading to his crucifixion and his death which was on a Friday. In some ancient European religions, there were 12 good gods and one evil god; the evil god was called the 13th god. And a meeting of witches, called a Sabbath, requires at least 13 witches along with the other story were witches are claimed to gather in groups (a coven) of twelve and during such ceremonies, the devil would appear as the thirteenth attendee. Traditionally there should be 13 steps leading up to the gallows. So it seems that unlucky symbols as tattoos usually have the reverse meaning and are considered lucky; this is due perhaps to some tattooists and tattoo collectors considering themselves as separated from everyday society. 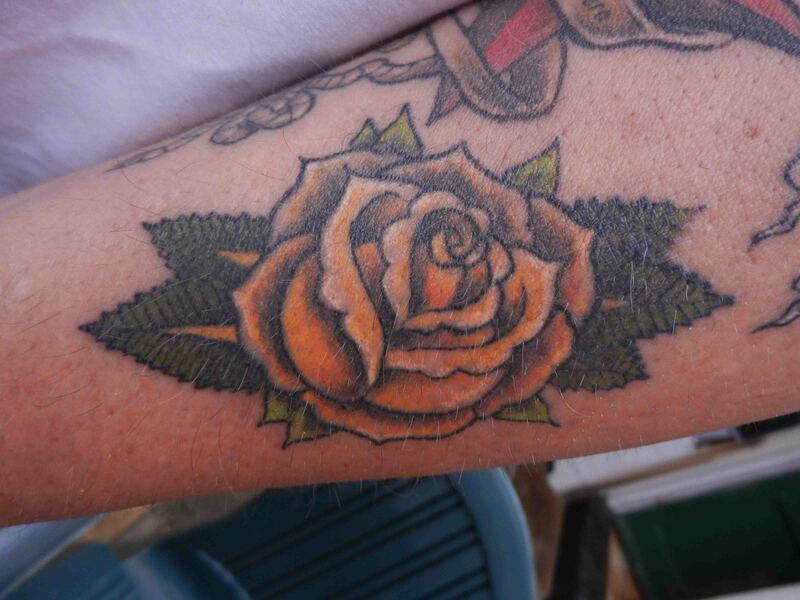 Roses are not only a beautiful flower but have been popular choice for both men and women for a tattoo since the 1930’s; but what does the rose symbolise. Your first thought may be in regard to its delicate beauty or its representation of love, inner and outer beauty and whilst you would be right there is also so much more to this beautiful flower. As a depiction of love it can be a symbol of being in love particularly when the rose is without thorns, or with as a reminder that love does not come without certain sacrifices when the thorns are present. So even the thorns have their meaning, some say that when thorns are present on the tattoo it means the person does not place a great deal of emphasis on outer beauty, whilst for others the tattoo refers to endless beauty with the thorn meaning you can look but you can’t touch. The Greek goddess of love, Aphrodite is often depicted with roses adorning her head, feet, and neck; and is thought to be associated with the rose bush that grew within a pool of blood spilled by Adonis her slain lover, or that her roses where white until touched by her blood after pricking herself on the thorns causing the blooms turned red. So for Aphrodite the interpretation is that the rose symbolizes an immortal love that withstands time and even death. The rose in tarot is considered to be the symbol of balance. The beauty of this flower expresses promise, hope, and new beginnings but when contrasted by thorns will symbolize defence, loss, and even thoughtlessness. Did you know that the number of petals on a rose is associated with numerology, and whether or not your rose is open or still in bud. The colour you choose for your rose will have a different meaning; the Victorians loved roses and assigned different meanings to the different colours. Yellow rose historically meant jealousy but is now a symbol of happiness, safety against envious lovers, and a mature love. White roses symbolize pureness, spirituality, youth and a maybe even a secret admirer. Red roses historically have been considered the symbol of true love or passionate love especially when presented as a single stem, but they can also represent sacrifice or memorial. Pink roses will represent healing, gentleness, grace, elegance and virtue. Blue roses have been used to signify the unattainable, fantasy or the impossible. Black roses are a symbol of death, farewell and darkness, not to be mistakenly used morbidly but more as a memorial. Coral roses represented your heart’s desire. Orange roses were a representation for enthusiasm, excitement and fascination for life. Light peach roses were for modesty and friendship. Purple roses are for enchantment and for love at first sight. Whilst it is interesting to find out more about the significance of certain images used for tattooing you need to choose the colour you would like to see your rose; and know that your rose has specific meaning for you. Whilst our favoured aftercare product for your new piercing is to use good quality antibacterial hand soap; the occasional irritated piercing is still going to happen. The saline soak is one of the better things that you can do to help your new or sore piercing. A mild saltwater solution can be used to irrigate, cleanse and rejuvenates your cells. It can also reduce any unwanted crispiness around the piercing site, which will prevent any trapped cell or skin particles which is often the cause of the lumps and bumps around the piercing site. Without thorough cleansing of your new piercing you can dramatically slow down the healing process. You can make your own saline solution, but if you do make your own saline solution please use a fine grain sea salt which is preferable to table salt which can contain additives; and distilled or bottled water. If you use boiled water it should have been at a rolling boil for at least one minute. For each 250ml of warm water add ¼ teaspoon of fine grain sea salt. Using warm water will help to stimulate blood flow open your capillaries and transport oxygen to the piercing site. The temperature of the water should be similar to that of a hot drink. Be careful not to make the solution too strong because if it contains more salt than your blood you stand the chance of irritating your skin. You may find that using saline salt soaks you may cause your skin to become dry, so it is important to rinse the area thoroughly after each soak. Make a fresh solution every time you soak your piercing. Mistakes are inevitable in life; as we progress through life our taste and choices change. Which for some of us means that you may find yourself with a tattoo that you no longer want or like? So you have reached the conclusion that it is time to do something about it and now you have some decisions and options to consider. Tattoo ink is placed under the skin in the dermis; which is under the layer of skin (epidermis) that you can see. Because tattoo ink is translucent, when you tattoo over an existing tattoo you are not covering it you are in fact combining the new tattoo ink with the existing ink. 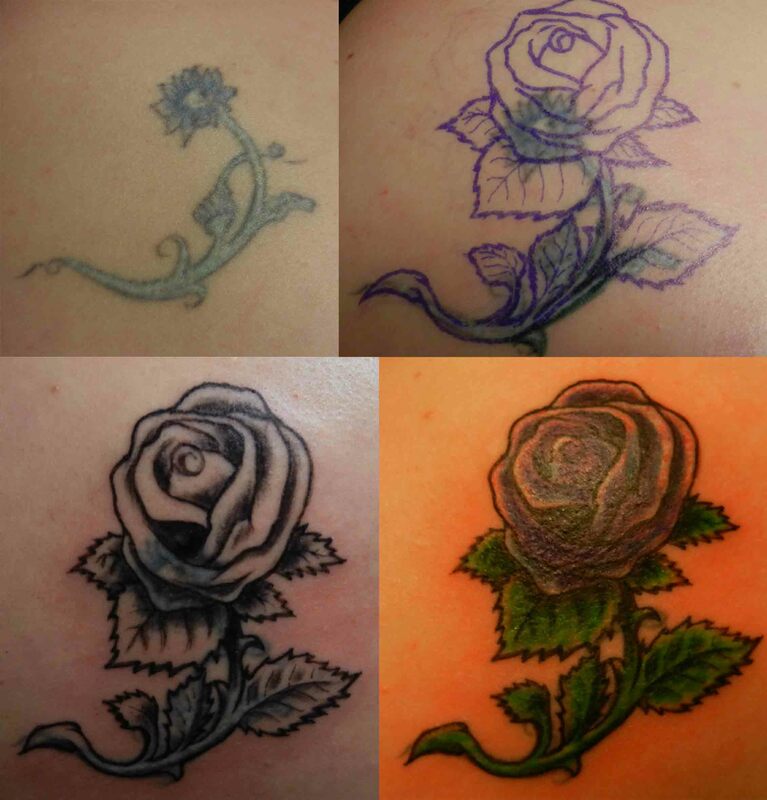 Once healed your new tattoo, the cover up, will have settled into the dermis layer and therefore into the original pigment. Careful consideration is required regarding the design of your cover-up; a cover up is not necessarily a simple process either and your new design will need to be bigger and darker than the tattoo you want to hide. On many cover-ups you may still be able to see a ‘hint’ of the old tattoo behind the new one once it is properly healed. You may have a very clear idea about what design you would like for your cover-up; but your tattoo artist may have to incorporate the shape from the old design to the new one. 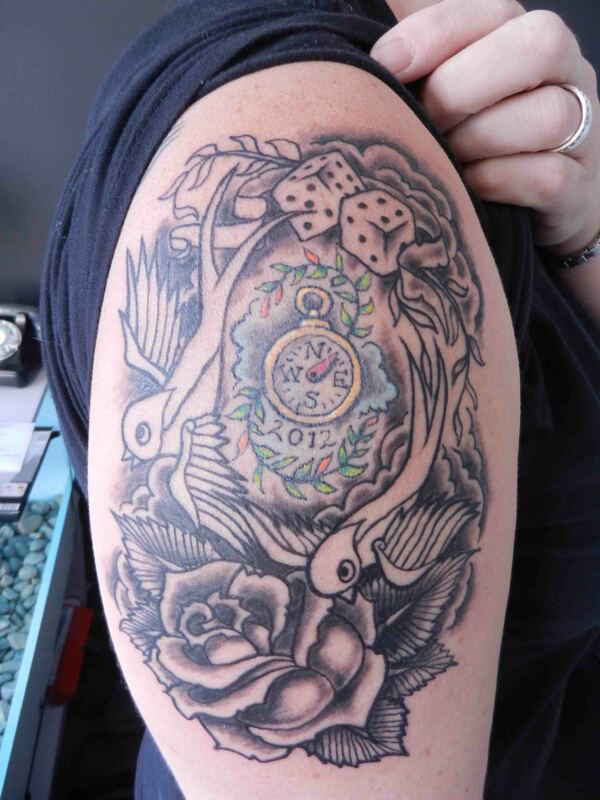 Along, also, with being able to recommend you on colours and contrast for your new design which could help guide the eye to distract from the old tattoo. The best cover-up are the ones that do not look like an obvious cover-up, so be prepared to have more than one sitting. Some cover-ups will present your tattoo artist an artistic challenge; but it is important to both take the time to discuss all your options. Today the more skilled tattoo artists will no longer choose to use solid black to cover up unwanted tattoos. There may be elements of your design which are not practical for a cover-up unless you have some laser removal on the original tattoo or change the overall design. Tattoo laser removal is also an option that should be considered; a couple of sessions could be enough to break down heavier lines of your original tattoo. Whilst it will mean that you have to wait longer for your cover-up it will mean that you and your artist will have far more scope when it comes to your new design. Many people feel that laser removal will have a drastic increase to the cost; this is often not the case as it could mean that you not only require fewer tattoo sittings but can even consider a smaller design. You cannot cover up an old tattoo with white ink. Because the white sits in the same layer as the old colour it will not make your original tattoo vanish. With repeated coverage you can slightly lighten the existing tattoo to a small degree. Your new tattoo design will often be a least three of four times the size of the tattoo you are looking to cover; unless you have laser removal on the existing tattoo. The image of the panther was used as the traditional cover up, because of the large amount of black required in the design. Tribal and flash art do not tend to work well for larger cover-ups, as most cover-ups need to be custom designed. Lighter colours do not always work well for cover-ups because tattoo ink is translucent the original ink will start to show through. Animals including mythological animals with scales or feathers, the shading required can be used to camouflage the original tattoo. Dragons and Koi fish; as they can be darkly shaded and carry bold colours. Biomechanical designs which have a lot of detail including shading. Floral designs, as they need shading around petals and foliage and can use strong colours. For background cover-ups black atmospheric shading can also work well as seen in the traditional Japanese backgrounds. However the best option remains too discuss all your ideas with your tattoo artist before setting your heart on a specific design. The Hannya Mask was originally used in Japanese Noh theatre to portray the souls of women who had become demons due to obsession, jealousy or being wronged by their husband. Noh is a classical Japanese theatre that incorporates traditional plays, music and lavish costumes. All actors in a Noh play are male and have the masks therefore to represent different characters. The Hannya mask traditionally was carved from wood is a type of onryo mask. There are many types of onryo masks, by the end of the 20th century there were over 200 types which represented the six main characters used to portray elders, old men, males, females, demons and spirits. While onryo masks can represent both genders, the Hannya mask is solely for female characters. The oldest Hannya mask can be dated to 1558. The Hannya mask is said to be demonic and dangerous but also sorrowful and tormented, displaying confused human feelings of passion, jealousy and hate causing the transformation of women into this terrifying monster. The mask when worn and looking straight ahead appears frightening and angry; when tilted slightly down, the face of the demon appears to be sorrowful, as though crying. Traditionally the mask would appear in various colours representing status, a white mask indicates an aristocratic woman, a red mask depicts a low-class woman, and a deep red mask depicts the true demons. Each mask possesses two sharp bull-like horns, metallic bulging eyes, and a leering mouth split from ear to ear. In Japan, the Hannya mask is a popular symbol for good luck, and is believed to ward off evil spirits from the home. The Hannya mask as a tattoo can be a stand-alone piece or incorporated into a larger, more elaborate Japanese tattoo design, as just one in many elements that make up the story being depicted.